Hardwood floor is a beautiful, long lasting addition to your home. It will increase in value and each hardwood floor tends to take on its own unique look and feel over time. Some people have the misconception that hardwood is too expensive or difficult to maintain for their lifestyle. Nothing could be further from the truth. There are so many varieties of hardwood available in different colors and finishes that there is a wood floor that fits anyone's lifestyle. 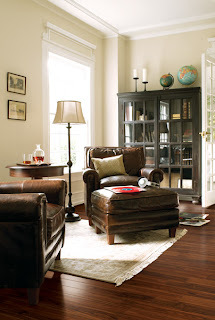 Homes throughout Indianapolis have turned to Kermans Flooring for decades to help select just the right hardwood floor. What should you consider before buying hardwood floor? Hardwood boards are cut with different edges: square edged boards or beveled boards. Beveled edges have a different appearance than more traditional edges. Aside from the apperance of the beveled edges, an advantage of this design is that is gives a more consistant look during times when room moisture causes minor expansions and contraction within the grove. The beveled edge can be more forgiving when installed. Kermans carries pre-finished hardwoods. Pre-finished hardwoods offer a faster and less labor intensive alternative to unfinished flooring. Because the finish has been applied in a controlled environment, there is more consistency in color & protective coating on each board. The overall floor tends to have a more uniform appearance and if an area becomes damaged, it only requires replacing the damaged boards – not re-sanding and re-finishing the entire floor. Check out our Online Hardwood Buyer's Guide for more tips and considerations. There is a lot to consider when buying hardwood and Kermans is here to help every step of the way. Our knowledgeable sales staff will walk you through all important decisions. We've helped homeowners in Avon, Zionsville, Fishers, Noblesville and throughout Central Indiana and we look forward to helping you find just the right flooring for your home and lifestyle. Visit our Castleton showroom and ask to speak to one of our design experts.